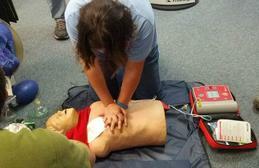 A first aid provider is someone trained in the delivery of initial emergency procedures, using limited equipment to preform a primary assessment and intervention until Emergency Medical Services, or EMS personnel arrive. A valid First Aid, CPR and Oxygen Administration certificate is required as a prerequisite for our Diver Stress & Rescue certification. We have several options available for you to choose from. 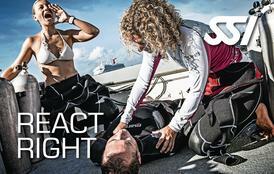 Enrolling in a REACT RIGHT program will increase your diving safety and comfort significantly. 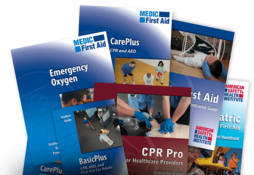 MEDIC First Aid BasicPlus is a combined adult CPR, AED, and first aid training program designed specifically for the occupational first aid provider. This extremely flexible program will help employers meet OSHA and other federal and state regulatory requirements for training employees how to respond and care for medical emergencies at work. 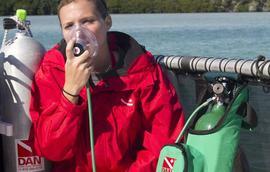 DAN Education fulfills a key element of the DAN Mission by educating the diving public and the medical profession on the appropriate care for divers injured in dive accidents. This education takes on many forms, disseminating information on topics related to dive safety through articles, reports, seminars, lectures and training programs.